Some nights I come home from "work" and I feel like a complete amateur in the game of creativity. These are usually the days when I'm working with designers, photographers, or a witty writer. I find their talents overwhelmingly beautiful and I question what it is that I'm bringing to the table that could somehow try and exist on the same playing field. It's a tough way to measure yourself, I'll admit that much. But, I always push harder to try and keep up, create something that's worthy or contribute something that can make someone, anyone, feel a little more special in a day. So, here's where I've figured out my place is meant to be in "bringing beauty to the world" - in honouring the real creatives of our time - the artists. This thought came to me the other day as I was sitting in Georg Jensen in London. I had been invited in to peruse the classic collections of Vivianna Torun Bülow-Hübe- perhaps the most famous designer for the brand, besides Georg Jensen himself- and with each item that I held in my hand I felt motivated to truly share with the world these pieces that told such an amazing story of a woman's lifetime. So, I started writing in my head, with each necklace, set of earrings or bracelet that touched my skin. This year, 2017, marks the 50th year that Torun has been working with Georg Jensen. Sadly, Torun passed away in 2004, but her designs live on and are, to this day, some of the most popular pieces for sale in the Georg Jensen boutiques around the world. 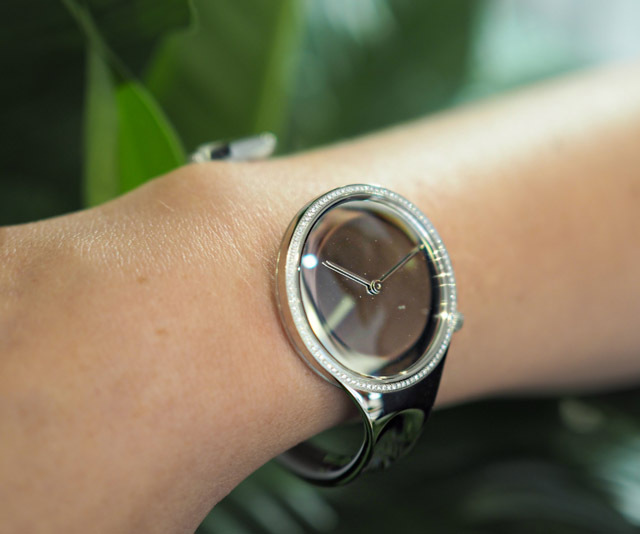 To talk about 50 years of Vivianna Torun Bülow-Hübe and Georg Jensen, we must start at the very beginning, at the point of meeting and the development of a watch that would change everything. The year is 1962 and Torun, who already had a prolific history in jewellery design, had created a watch for the Musee des Art Decoratifs at the Louvre. The subject for the exhibition was "objects you hate." It was for this show that Torun created the famous, but not yet iconic Georg Jensen watch, known as the Vivianna Bangle Watch. So, why would she choose a watch for "objects you hate" and why is it different than anything else we'd ever seen before? "Back then watches were only chronometers - measures of time, which one got constantly caught out by. I wanted to free people from the slavery of time, I wanted to make a watch which reminded one that life is here and now, so I created a watch with a mirror face, no number and a simple second hand. A watch should not make us prisoners of time - but liberate us. Perhaps it is possible to make a timepiece which more intensely perceives the Here and Now. The watch is open ended to symbolise that time should not bind us, and the dial like a mirror reminds us that life is now." While I am sure the naysayers would argue that Torun had an idealistic viewpoint on how time could be perceived, The Vivianna Bangle Watch truly does deliver time in a different way to anything we've ever seen before. This could, of course, be the reason it is a best seller. I wore the watch for only a few moments, but can honestly feed back that there is a sort of calm that comes over you when you check the watch for time. It's easy to see how the artist behind the masterpiece is intending for the wearer to slow down and appreciate time, with such a fine piece. Yes, I have officially sipped the Georg Jensen Kool-aid and I'm sold. But, the collection from Torun doesn't start and stop with the creation of the original watch. 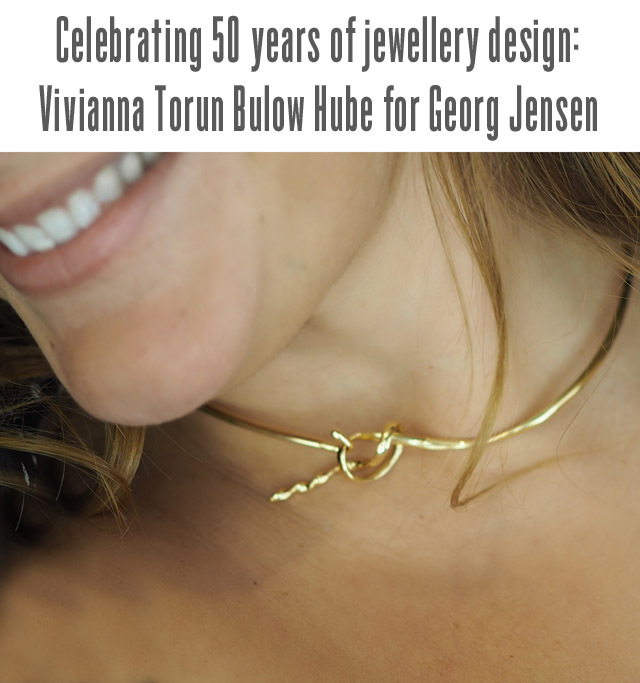 In 1969, Vivianna Torun Bülow-Hübe began designing exclusively for Georg Jensen. 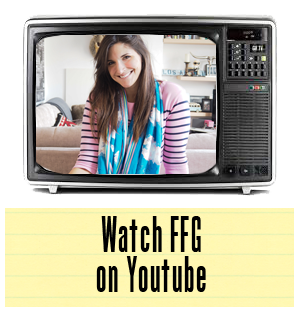 She manufactured everything from necklaces to rings for the company. One could, and sometimes would, wear only Vivianna Torun Bülow-Hübe, from neck to fingers, when showcasing their jewels. Just ask Brigitte Bardot, Billie Holiday or even Pablo Picasso, all fans and friends of Vivianna Torun Bülow-Hübe. Surprisingly, however, Torun was an artist that was understated in her approach to using fine gemstones. Instead of letting rare gems take over the spotlight in creations, Torun provided pieces of jewellery that spotlighted the wearer. She once famously said: "A piece of jewellery should be a symbol of love. It should enhance and move with the body so that it blends with you. It must not overwhelm, but enhance you. This is why it must be timeless. It shouldn't matter if you are 17 or 87 years old." For me, there is no better reflection of this mindset than Torun's Forget me Knot collection, and specifically the Forget Me Knot Neck Bangle - woven from a single strand of gold. 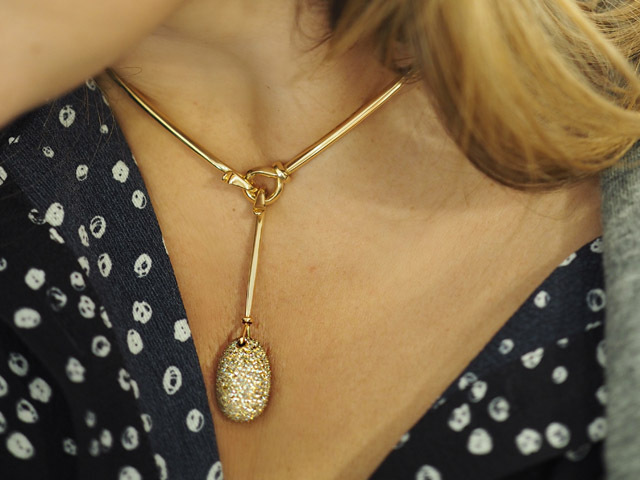 This is a piece of jewellery that is not only sentimental in its tale, but also beautiful in its composition-a creation that would suit any woman for any occasion. And this is important to say, because I do believe Torun had a keen understanding on what women wanted for jewellery. She wanted her pieces to be both practical and spectacular. She wanted the women wearing the pieces to feel enhanced on every level while being decorated by the designs. Now, there is no way we can mention Vivianna Torun Bülow-Hübe and not discuss her iconic Dew Drop collection with Georg Jensen. The collection takes inspiration from early morning dew drops. It is soft and feminine, yet sturdy and commanding of attention. The pieces are bold, yet subtle. How one creates such a contrast is truly unknown to me. Instead, I simply stand back and appreciate it. Or, as the case may be here, I put on as many different pieces as I can and marvel at the beauty of the designs and the way in which they truly do seem custom made for every single wearer. Last, but not least, let's talk about the Torun Bangle. Again, we see a piece of jewellery that has more to it than meets the eye. This is the piece that I have seen out and about the most and have silently admired the wearer's choice from afar. 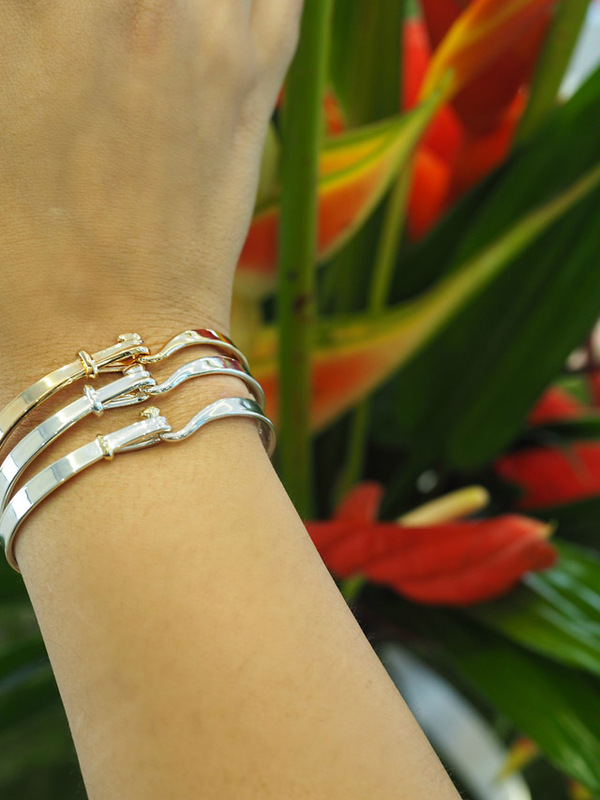 The Torun Bangle comes in every which way you can imagine - from simple sterling silver to gold with diamond detailing. They are often layered (I hear they make perfect push presents) and the design features a theme that runs throughout the Georg Jensen collection - "coming together to be stronger than apart." Quite romantic if you think about it, and very true in this particular piece from the collections. Just a note to any man looking to score some serious present giving points, think about gifting this bangle and use that line - "coming together to be stronger than apart"- and I can guarantee some serious swoons come Christmas time. Yes, men in my life take note. It's what I'm expecting from someone, anyone! To truly appreciate every piece of Vivianna Torun Bülow-Hübe for Georg Jensen, the objects must be admired in the flesh. Each and every piece of jewelery is crafted in a way that pictures cannot do justice. The only true admirer is the wearer. And to wear a Torun piece is to be the owner of a masterpiece, one which future generations will hopefully appreciate. Now, if you'll excuse me, I'm off to start a savings jar so I can be the proud owner of a Torun- any Torun! 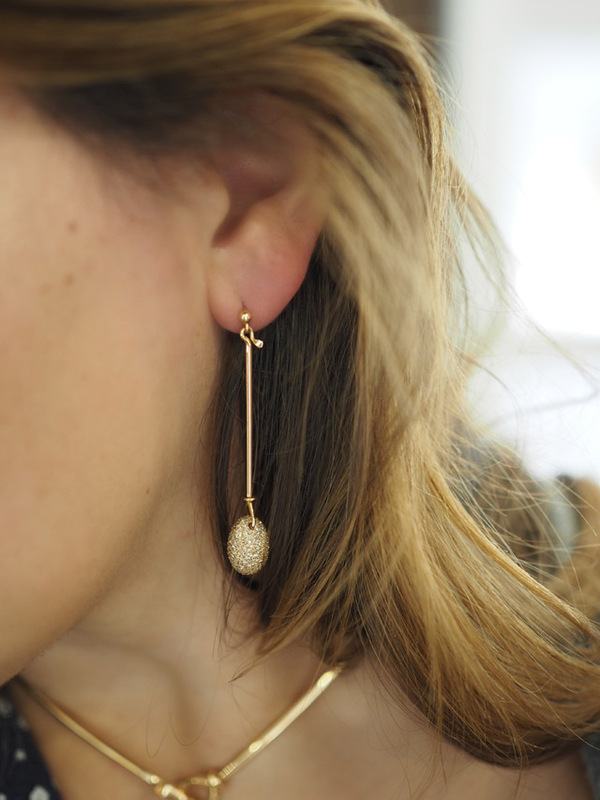 Fashion Foie Gras worked in collaboration with Georg Jensen on this post.